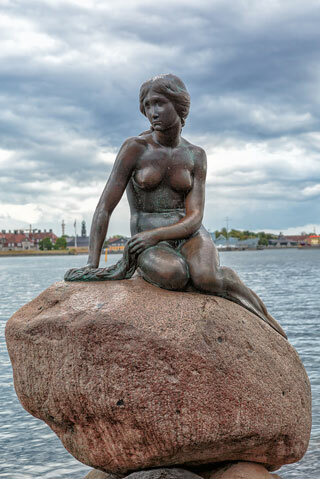 The Little Mermaid is a bronze statue by Edvard Eriksen, depicting a mermaid. The sculpture is displayed on a rock by the waterside at the Langelinie promenade in Copenhagen, Denmark. It is 1.25 metres (4.1 ft) tall and weighs 175 kilograms. Based on the fairy tale of the same name by Danish author Hans Christian Andersen, the small and unimposing statue is a Copenhagen icon and has been a major tourist attraction since 1913. This article uses material from the Wikipedia article "Little Mermaid Statue", which is released under the Creative Commons Attribution-Share-Alike 3.0 License.